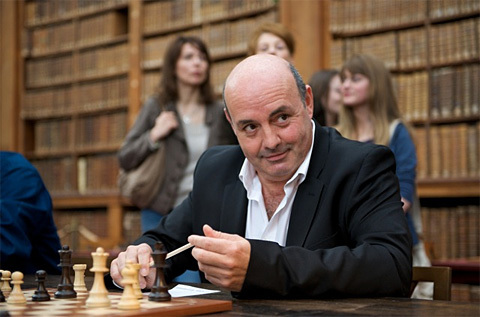 1/24/2011 – Instead of adopting an ostrich position the President of the French Chess Federation and his VP have initiated an investigation of French Olympiad members suspected of cheating. They have appointed Leo Battesti, a Sorbonne-educated lawyer, as the spokesperson for the Federation. Battesti has reacted to the criticism of one of the accused player with an interview in Europe Echecs. What exactly is the cheating system that was used? Have the authors of the cheating admitted the facts? You understand that it may be difficult for me to speak on facts that are the subject of an investigation. What I can tell you is that we, the federation leaders, are the last to wish to see such a procedure initiated. Unless we are masochists ... It is indeed difficult and very painful. And I take this opportunity to congratulate Jean-Claude Moingt, our President, and Joanna Pomian, Vice-President, for their courage. Both are witnesses in this very serious case. They placed the sporting interest before their own comfort. They could have adopted an ostrich policy rather than assuming their responsibilities. They were perfectly right in doing so. It is in these situations that leaders are judged. In a world where cynicism often takes place before policy, it warms my heart to see such action. I want to say that with both being called to testify, the office designated me as the federal spokesperson for this case. What prompted the FCF to make this matter public? Precisely this concern of upholding sporting values. We highlight the social and educational virtues of chess, and we would have been in total contradiction by cowardly remaining silent to protect ourselves from the bother. Finally I can tell you, considering the testimony and facts brought to the attention of the office members, we are unfortunately justified in initiating such proceedings. In Khanty-Mansysk, as everywhere now, officials are nevertheless very attentive to cheating, there there is no way to prevent it? It is difficult to cope with technological developments. There is nothing easier, during live broadcasts, than to relay suggestions. A single help, in complex situations, and it is almost a guaranteed a win. As the organizer of international events I have often been alerted by certain behaviors. But often in the name of the legitimate presumption of innocence, and without evidence, without specific testimony, it is difficult to intervene. However one must act, both via the body of arbiters and by technical means to limit the current drift. We will therefore propose to the next Administrative Committee of the FCF, on January 29, the technical means to organize the next European Championships in Aix-les-Bains: a delay of at least 15 minutes on the live internet broadcast of the games, banning mobile devices, etc. ... It is true, however, that when there are financial stakes, the risks of cheating increase. In my opinion, and this is only my opinion, lacking the adequate technical means, one should fear the worst for the future of classical games endowed with prizes. We are not adrift in a generalized situation as in professional cycling, but we must be on our guards and act. And now, what are the expected procedures, both national and international, for the rest? The Disciplinary Committee of the FCF has been enacted. The investigation is underway. FIDE has obviously been informed. At no time did we hesitate to take appropriate action. We can neither compromise, nor negotiate under such circumstances. And this policy will prevail in all our future options. In your opinion, what are the consequences on the image of chess in general and the France team in particular? Ironically I think the federal image will be even more positive. I actually took a look at French and international forums and many users praise the political courage of the FCF. I think the moment we act to defend the sporting interests of chess, there is no need to fear. What would have been highly prejudicial, is silence. Both for our consciences and for the benefit of chess. What I also want to say is that the other members of the French team are absolutely not involved. They are even, in my opinion, the victims of this situation. But we are very proud of them, their natural talent and probity. Cheating is, thankfully, a very marginal event. 99% of our players are sportsmen. One can therefore be reasonably optimistic. What do you think of Sebastien Feller's denials? Pathetic! And insulting to our president and his federation. I think this young player is ill-advised because instead of taking responsibility, he seeks to divert attention by sullying the honor of a great man of French Chess.